A reminder of the protests of Feb. 2008 against FARC’s violence. This is not current Venezuela. 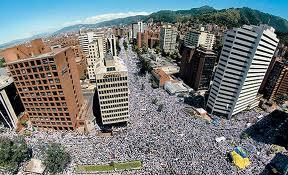 This was Colombia in February 2008, during the protests against the violence caused by the FARC. 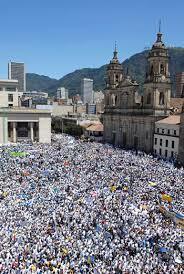 The multitudes pictured above do not want to see the FARC in congress but in prison. How fickle can President Santos be! During his presidential campaign, throughout 2009 and 2010, President Santos spoke of his commitment to eliminating more than 20 FARC camps on the Venezuelan side of the border, and half as many in neighboring Ecuador. Santos was elected with an unprecedented mandate to continue Uribe’s strong fight against decades of guerrilla violence. But instead Santos turned sharply left and became blatantly corrupt in the last eight months. In the government peace talks currently taking place in Havana, Santos has even conceded to political quotas to the FARC, which he said he would never do. True enough that, historically, conflict resolution seeks to create political spaces for individuals and groups with an ideology. But the FARC are drug gangs using ideology to mask their narco-trafficking activities. The FARC themselves finally admitted their involvement in drug trafficking. People worldwide are concerned about what is being discussed in these so-called “peace” talks, in which terrorists are rewarded and victims are disregarded. It seems the peace deal now in the works with FARC will legitimize thugs in Colombian politics. Colombians are feeling betrayed by the current administration. And so the victory of former president Alvaro Uribe and his Centro Democratico party in the recent senatorial elections. Uribe’s new Centro Democratico party won 20 of the Senate’s 102 seats against 47 for Santos’s weakened coalition. Santos’s Partido de la U got 21 seats, according to official results. “I’m afraid of what will happen if an impunity pact is signed with terrorist leaders,” Uribe said at the close of his campaign. Aren’t we all afraid? 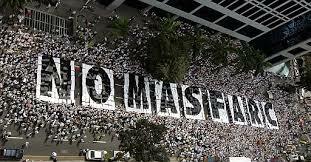 Take a look again, at the masses pictured above, who showed up to protest against the FARC’s violence in 2008. It looks a lot like Venezuela nowadays. Although Uribe and his Centro Democratico are a minority (at just under ten percent of the vote), their presence in the senate thins the majority that Santos will rely on if re-elected, or for legislative support to implement any political quotas to the FARC. “With many seats, or with few seats, Uribe’s goal is going to be to obstruct Santos’s government,” said Claudia Lopez, a Senate candidate for the Green Alliance. At the very least, an opposition can check-and-balance and put a mark on any transitional laws. « Doña Nydia taught me to have empathy above all.